To meet the demand of the world’s growing population, farmers need to improve the productivity of their herds. 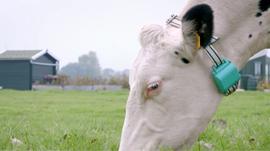 Amsterdam-based Connecterra recently raised nearly $2 million to further develop their GPU-accelerated deep learning solution that consists of a wearable device that monitors each animal in the herd and transmits the data to a cloud platform for analysis and prediction of behavioral patterns. The startup expects to make the service commercially available in the first half of 2016.